Prime Minister Theresa May is fighting to keep her Brexit plans on track amid a Cabinet row over proposals for the Irish border and a potential revolt in the House of Commons. The UK's proposals for a 'backstop' arrangement for the border are to be published shortly, although Brexit Secretary David Davis is understood to have concerns. Mrs May is facing a revolt from eurosceptic Cabinet ministers who fear it could keep Britain tied to the customs union "indefinitely" after Brexit. Plans for the arrangement were due to be published today but could be delayed. 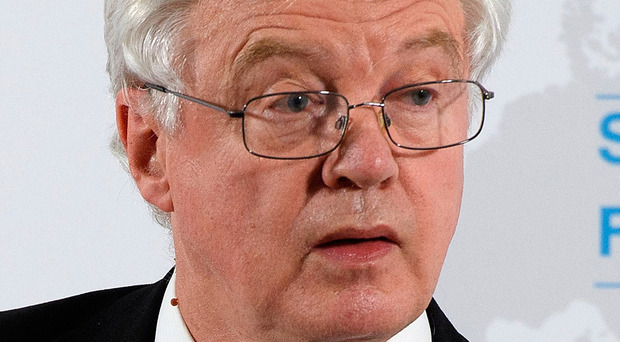 Mr Davis has heaped pressure on Mrs May by insisting there will be a time limit on backstop plans to keep Britain in the customs union after Brexit. The backstop document is expected to set out an arrangement under which the UK would remain within elements of the EU's customs union, in the event that it is unable to agree a preferred solution for Northern Ireland. The Prime Minister shared with her Brexit war Cabinet a note detailing her plans for an "Irish backstop" in the event that customs arrangements are still not resolved after 2021. The note infuriated eurosceptic Cabinet ministers because the backstop does not state when the it will come to an end. It threatens to test Cabinet unity, with Mr Davis thought to be pushing for a provision to ensure the UK can withdraw unilaterally. British ministers are also concerned because it does not state that the UK will determine when customs arrangements are completed, which had been one of their key demands. There are also concerns that Britain will be tied to the rulings of the European Court of Justice during the backstop period. Foreign Secretary Boris Johnson along with Mr Davis are both understood to have significant concerns about the backstop in its present form. A senior Conservative said: "There is no mandate for this, more to the point politically it's very difficult because a lot of Conservatives will be very concerned that we are giving an incentive to the EU to keep the backstop in place forever. "There is going to be an almighty row, this is a crazy situation." Asked if he could stay in his job if the government's backstop proposals did not have his explicit approval, Mr Davis said: "That's a question I think is for the Prime Minister." Answering questions after a speech on security co-operation, Mr Davis confirmed the backstop had still not been signed off by ministers. When asked if the proposal would be published today, as reports had suggested, he said: "It's for a Cabinet committee to decide that. "If they conclude then you'll see it, but it's up to them to decide." He added: "The detail of this is being discussed at the moment. It's been through one Cabinet committee, it's going to another and it would be improper of me to pre-empt the negotiations there, but I suspect it will be fairly decisive."